Controlling the multitude of systems on modern boats can be complex and many modern boaters expect the same level of automation and convenience they find in their cars. It’s clear the industry has realized this and is working hard to develop systems that make controlling your boat simpler and more intuitive. 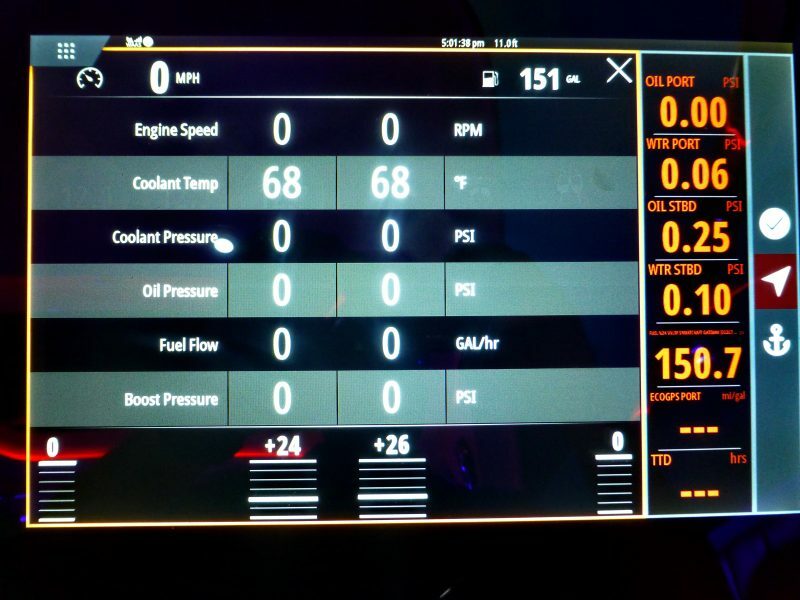 I had the opportunity to try out two such systems at the Miami International Boat Show: Navico Information Display (ID) on the new Sea Ray 350 SLX-R and Prestige’s Ship Control aboard a Prestige 460 Fly. While these systems vary in several meaningful ways they both give an exciting glimpse into the future of managing a boat. As Ben Ellison mentioned in his entry about the new paradigm that ID represents, Navico had ID systems installed on 14 boats at the show but didn’t — or couldn’t — make much noise about them. It took me a while to realize that the more successful these systems are, the less they will be discussed. Control systems that work well fade into the background. So instead of thinking about the system, you think about what you want to control. Navico’s ID is an extremely ambitious product. 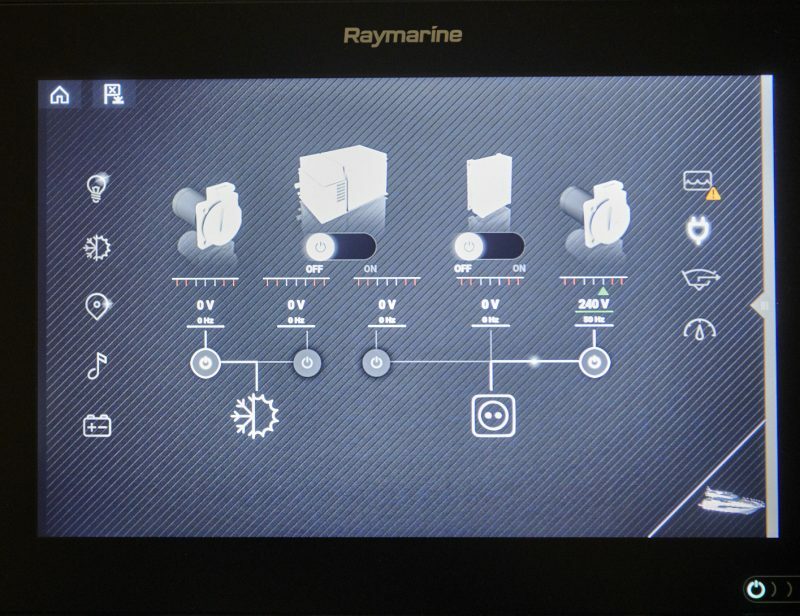 Navico hopes to deliver an integrated, automotive-style control system on many different boats from a range of boatbuilders. To provide that integrated experience they will need to support vast numbers of sub-systems. Thinking about the number of makers of digital switching, stereos, air conditioners, generators, trim tabs, engines, and all the related support systems means Navico will need to implement a truly dizzying number of integrations. One of the very positive trends in the industry recently is the amount of cooperation between brands and ID looks to continue that with Navico supporting equipment from many companies with which they also compete. The Sea Ray 350 SLX-R on display in Miami has a Fusion Stereo (Garmin) with Naviop digital switch (a Navico product on a Brunswick boat, while Brunswick also owns C-Zone), monitoring from Nautic-On (another Brunswick brand), and chargers from Mastervolt (part of Brunswick’s Mercury Marine division through the Power Products acquisition). To help realize their vision for integrated control Navico developed the ability to bond multiple displays to a single continuous piece of glass cut to nearly any shape. This allows for glass dash assemblies like the one seen above on a Tidewater with four displays bonded to the glass dash. We’ve seen glass helms with displays neatly recessed into the console so it appears almost as though the whole helm is a single sheet of glass, but this is the real deal. The whole helm IS a single sheet of glass. The rear view of these consoles shows what a neat trick this and probably not easily accomplished for somewhat heavy displays bonded to glass that will then be bounced around on the open water. 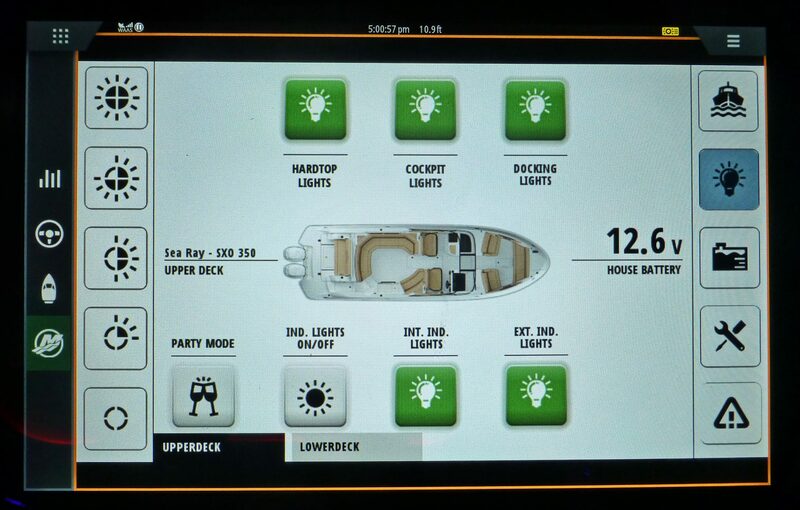 ID’s game-changing feature (so far) is the Modes that allow a user to control many aspects of the boat with the touch of a single on-screen button (like the ones seen at right above). If you enable your Dockside Mode, for instance, it can set the thermostats to a comfortable setting, switch the stereo to your favorite channel, and turn on the fresh water pump along with other systems you might want on while dockside. When you’re ready to pull away from the dock you’d enable the Underway Mode to turn on the radar, fire up the generator, and change the screen pages to chart, radar, and engine gauges (and turns on the nav lights if it’s after dark). Modes can also be defined for other frequent activities like at anchor, watersports towing, or docking. On the Sea Ray the mode controls were always visible as three icons on the right side of the right screen. The check mark icon is for dockside, the location arrow for underway and the anchor for anchor mode. The ability to automate activities and make changes to all the systems described is based on how Navico interfaces with onboard systems. Rather than just display an interface from another system, ID understands the data coming from those systems. So ID knows if the airconditioning is running or not and what temperature it’s set to. To accomplish this, either Navico or the system manufacturer needs to use Navico’s application programming interface (API) so the individual components can fully interact with ID. 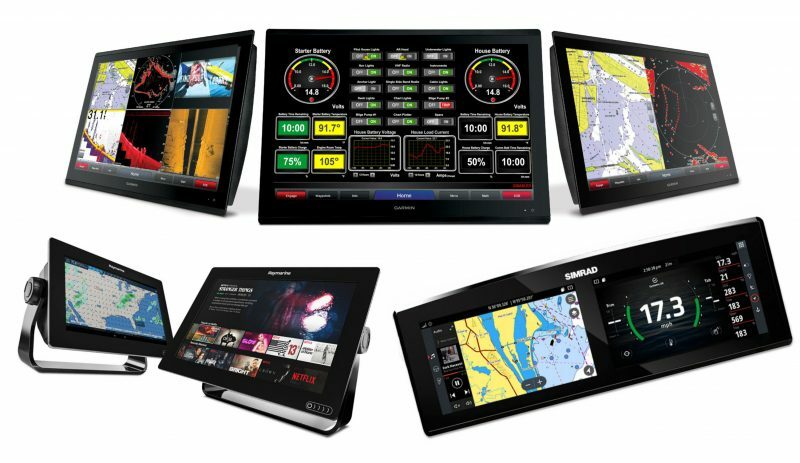 We’ve seen quite a few examples of display and control integrations with HTML5 and NMEA-2000 and, in fact, Furuno, Garmin, Navico, Raymarine and Navico themselves all have published APIs for integrating display and control into their MFDs. But, there’s a big difference between ID’s level of understanding and the rest of the integrations we’ve talked about so far and that difference is understanding the data. For instance, raising an alarm because the engine told the MFD to raise an alarm is quite different from raising an alarm because the MFD sees zero pounds of oil pressure in an engine and really understands what that means. So that’s the promise of ID, but that promise comes with a challenge. For ID to deliver it needs to be able to control all the systems via deep API integration, and this will be easier for high volume production boats with manageable standard features and options. The larger the boat gets and the more customizable it is, the harder this will become simply because of the number of systems involved. Navico believes they’ve developed an API set that is straightforward to implement and that will enjoy broad adoption. ID’s success, in my opinion, hinges on Navico’s ability to build momentum and that momentum will come from convincing component manufacturers to implement Navico’s ID API. 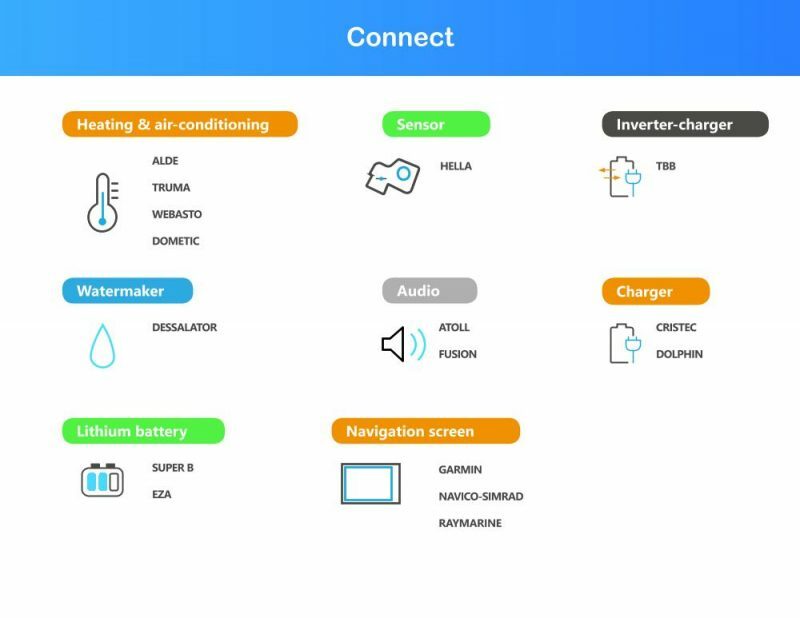 If the system is successful and there’s builder demand for individual components to be supported we will see the component manufacturers spend the money to complete ID API integrations. It’s these integrations that will allow ID to truly be the one interface that controls the entire boat. There are quite a few components to Navico Information Display. 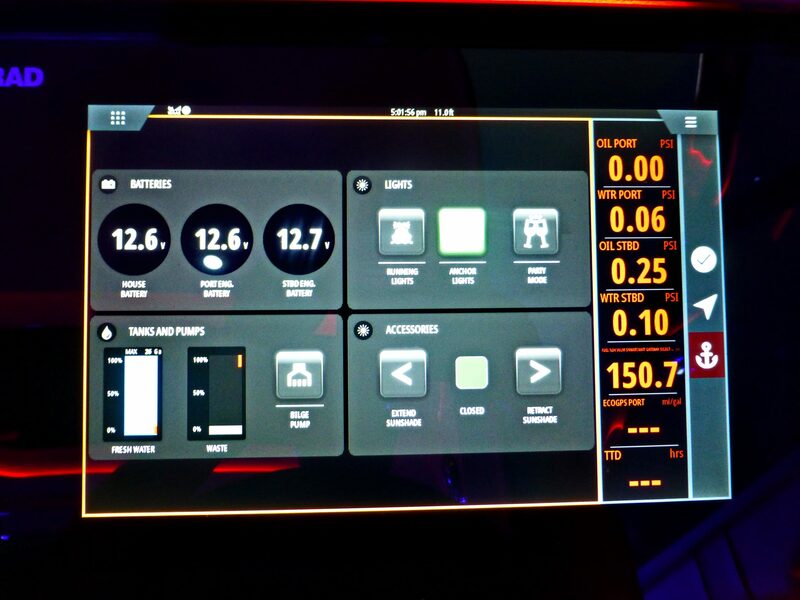 Navico is using a black box style processor they call the Integration Hub. 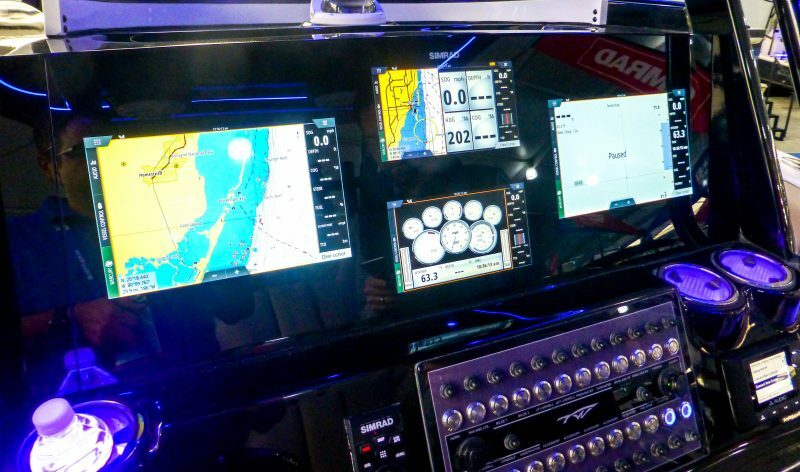 The hub drives the displays, connects to control systems and runs the Navico Operating System (NOS) navigation software and control software. 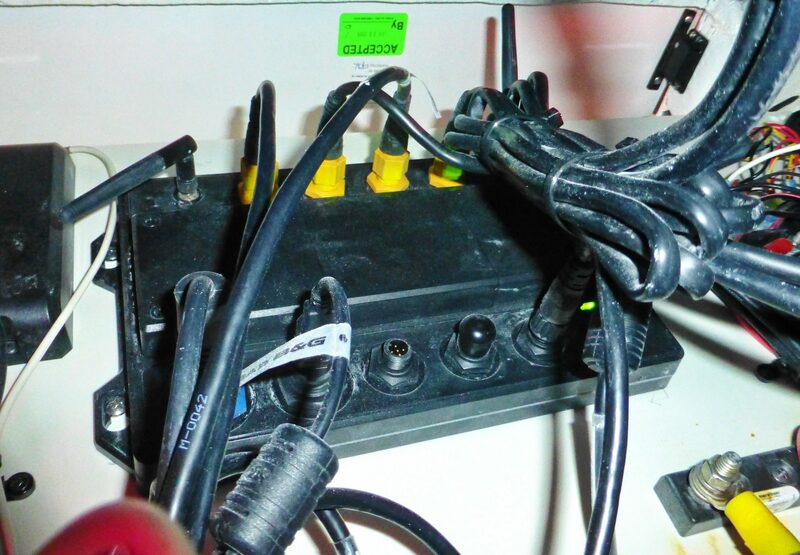 The hub has Ethernet, WiFi, Bluetooth, USB, CAN, NMEA-2000 and Sonar connections. The heart of ID is the Integration Hub. 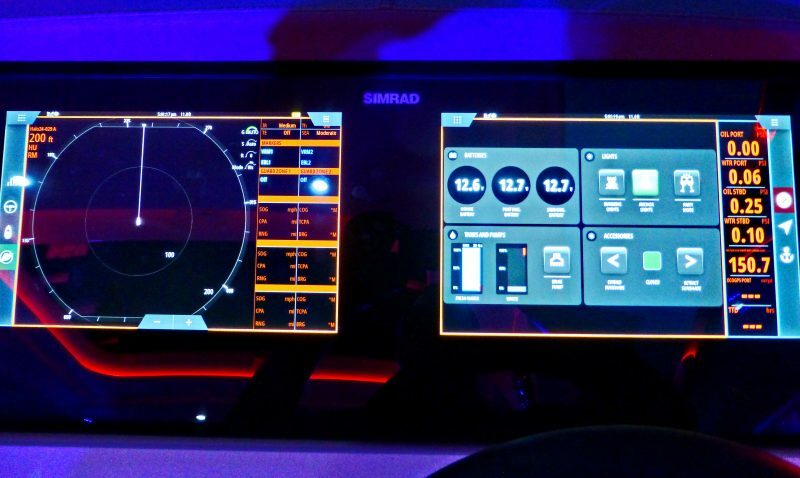 It serves up the familiar Navico family user interface (Simrad’s in the case of the Sea Ray) and connects to the navigation components (radar, sonar, etc) as well as all those other wired and wireless data networks already cited. In July of 2017 Navico bought Naviop, a company with deep capabilities in monitoring and controlling marine systems; in fact, in February of 2017 Leif Ottosson gave a presentation that turns out to be a good preview of what Navico and Naviop were working on. The Sea Ray 350 SLX-R had both the Integration Hub and the Naviop OP Box and while I’m not certain which functions are being managed by the Hub and which by the OP, I don’t think it matters much (and further suspect that the configuration on the Sea Ray isn’t likely to be the exact production config). Although it’s not easy to see in the photo I snapped by sticking my camera blindly behind the helm, it appears the displays are connected by first connecting one display to the hub via Ethernet and then daisy-chaining subsequent displays to each other. 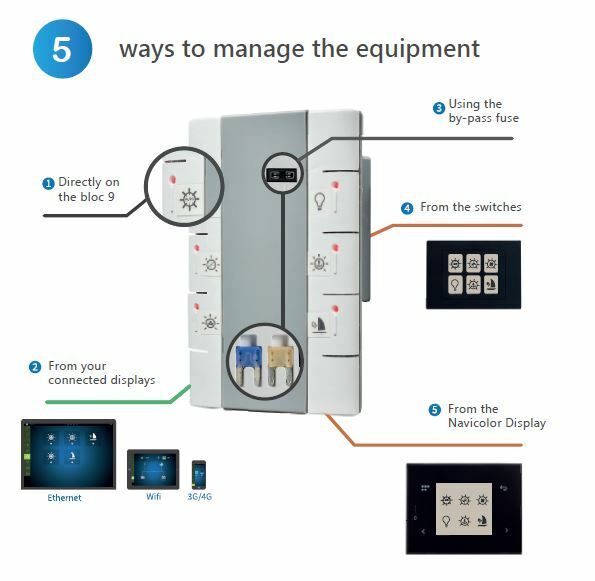 This means the installation of a four-display ID glass helm can be as simple as physically securing the glass, running one Ethernet cable from the ID hub to the first chained display and power cables to each. I suspect this is a significant time saver for a builder when compared to making four precise cuts in a dash and then individually cabling four MFDs. 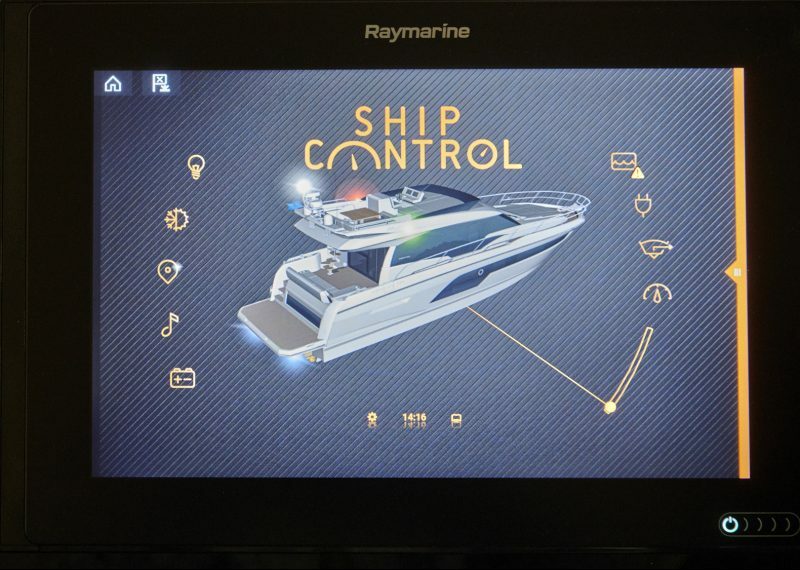 Ship Control has been available on Prestige yachts since the 2018 model year, and is a partnership with Scheiber Electric, a French company like Prestige. There are some deep parallels between Ship Control and Navico’s ID but also some significant departures. Perhaps the single largest difference is that Ship Control — and the underlying Scheiber Multibloc I’ll discuss below — isn’t replacing the MFD and dash the way Navico is with ID’s glass helms. Ship Control, like ID, aims to let you control your vessel from a single interface, but Ship Control is so far designed for a single builder which simplifies the integration challenges I described above. Scheiber plans to begin marketing their system to other manufacturers later this year, but they’ve been able to build a base of supported systems with Prestige. And getting component manufacturers to integrate with Scheiber Bus may have been easier given the buying power of Prestige’s parent Beneteau Group, the largest recreational boatbuilder in the world. Prestige, as the builder of the boats, can carefully control what equipment is used and ensure there are integrations for each component they select. Currently, Ship Control and ID are targetting different sized vessels with Prestige’s smallest boat at 42 feet and their range extending up to 69 feet, while thus far ID has been shown on boats 35 feet and under. Ship Control is built on Scheiber’s Multibloc Network, a control system they’re currently marketing in the RV, emergency vehicle, trucking and now marine markets. Multibloc integrates HVAC, sensors, chargers, inverters, watermakers, lighting, entertainment systems and more into their own control bus. Called Scheiber Bus, it’s a CAN bus based network similar in concept to NMEA-2000 but designed to be so cost-effective that integration into a component won’t materially increase the cost. The WiFi Server (Scheiber’s term for an integration hub) is compatible with WiFi, NMEA-2000, LIN bus, CAN bus, Ethernet and USB. The WiFi Server also serves HTML5 pages allowing onboard MFDs and mobile devices to fully control the system. 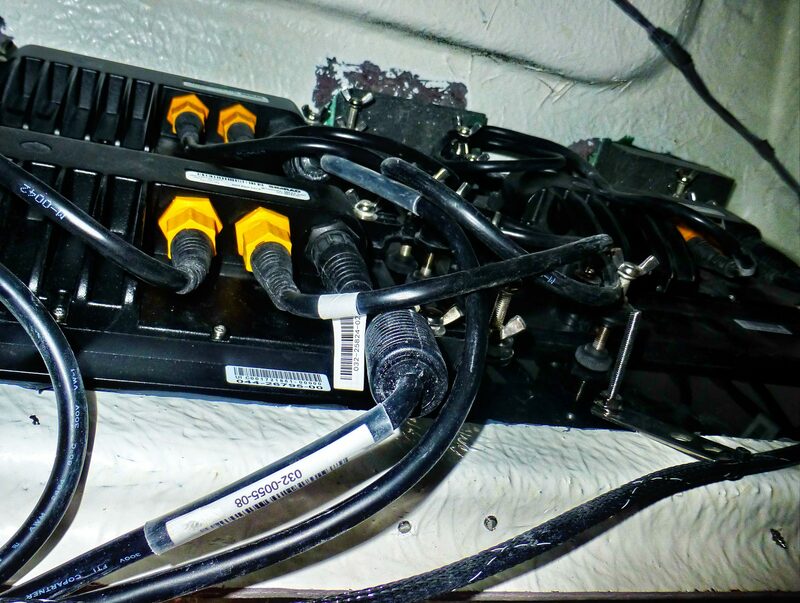 Scheiber Bus, like NMEA-2000, requires a terminating resistor on each end of the network, but unlike NMEA-2000 the tee connector functionality is built into each component so each component has two ports and the network daisy chains through the components. 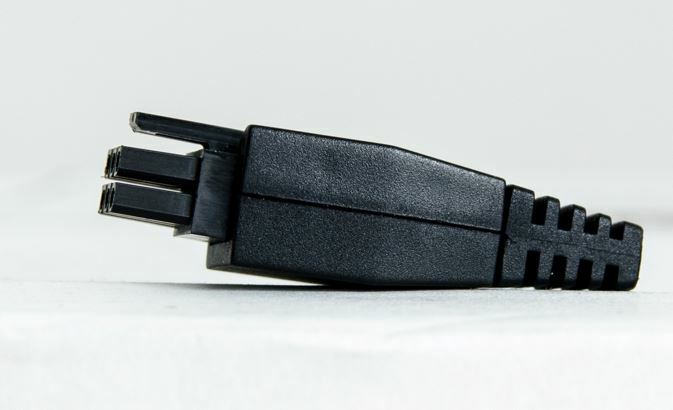 Scheiber has selected an inexpensive Molex connector for Scheiber Bus to keep the cost of interconnection cables down. 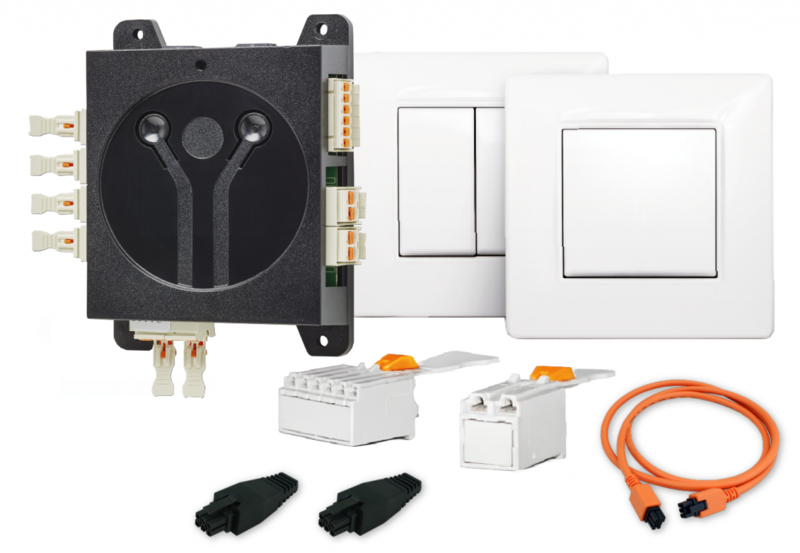 Multibloc (and hence Ship Control) support Scheiber’s Light Air line of kinetic wireless switches. These switches allow a light switch to be placed anywhere on the boat without wires or batteries. I imagine that the time saved by not needing to run wires to each switch location, plus the advantage of being able to easily relocate any switch, makes Light Air a pretty attractive option for builders. So, we had two pretty ambitious but different control systems demonstrated on production boats at the Miami Boat Show. I think that both offer a tantalizing glimpse of what we will see on new boats moving forward. The designers have a meaningful challenge to build support for the wide variety of equipment installed on boats, but the payoff is greatly improved control of the boat along with easily understood helms. The promise of much greater intelligence and automation paired with weight reduction and simplified wiring is great. I’ve heard some concern about the complexity these systems can represent (and seen some failures of demo systems to remind me), but I think that ultimately we’re making good trade-offs. 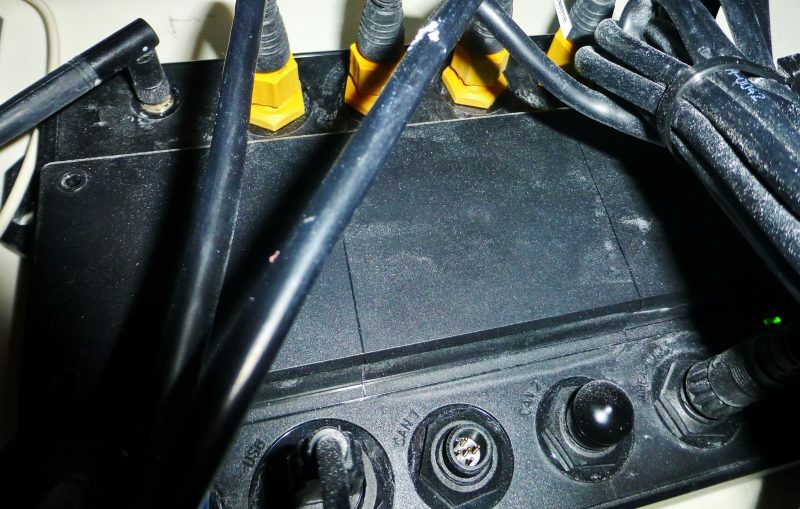 Though the control systems are more complicated, anyone who has pulled open an electrical panel on a 60′ boat knows how complex and unmaintainable those wiring systems can be as well. I think what we see demonstrated here is the tip of the iceberg of what will be possible, and quickly expected, on modern boats. Boats are large investments and buyers expect they will deliver the same kind of automation they’re able to get at home and in their cars. These systems can deliver on those expectations. No comments on Boning systems that do exactly the same thing? Fleming yachts has used them successfully for years? Time will tell, but whole boat system integrations like ID (when it’s used that way) will certainly be different. It’s hard to picture an owner upgrading to new electronics when that means modifying a big glass slab with displays bonded to the back, but then again who modifies their car dash anymore? But then again updating firmware on multiple subsystems may be much easier, though probably done at a certified service facility. I think that all these issues point to why smaller production boats are the sweet spot for this technology, at least to begin with. Most modern cars don’t even try building integrated solutions, as consumers are sick of buying something that is expensive, not updated, and impossible to upgrade. That is why Apple’s CarPlay and Android Auto are now the default on a ton of car brands, many of them the premium ones. I think as an evolutionary step, having a big glass bridge with integrations to other systems is a good thing, but I agree partially with Aleksandr – it should not be proprietary, and the vendors should realize that owners will want to upgrade the operating system and capabilities throughout the life of the boat. I doubt that has been designed in as well as it should be. Steve, aren’t CarPlay and Android Auto analogous to how the SeaRay ID system can control the Fusion audio? In other words, little to do with the hard integrations like digital switching, modes across systems, etc. My concern is that more people will spend time evaluating the glass helm than looking past it. Does anyone in the ‘know’ feel this will contribute to more accidents while ‘go fast’ boats are operating? I strongly disagree in principal, Charles. Better data presentations and more intuitive controls can free a skipper to exercise maximum situational awareness. However, that doesn’t mean that the skipper will. I think that the most dangerous boat I ever owned — the 25-foot 25 knot IO Ralph — was also the one that probably looked easiest to handle in the eye of an inexperienced boater. It was an easily manageable size and drove like a car. Open water offers incredible freedom and the consequences of hitting a ledge at 25 knots are not obvious. I can understand the concerns on both sides of this issue but I tend to agree with Ben. The reality is most boats present endless opportunities for distraction. The control systems we’re looking at here serve to focus the myriad different places controls were previously located into one spot that can be accessed without walking away from the helm or even fully looking away from the world in front of you. Additionally, these systems can automate tasks that might previously have taken the operator’s focus away from managing the vessel. Overall I believe that’s a real improvement in operator awareness. On the Fleming’s literally every function on the boat is integrated. It will tell you if the Mac light is out, or the amperage draw is off spec. It will tell you if the volume of water through any pump on the boat is compromised. The list goes on endlessly. When you get on the boat, there is a checklist of items that is either green for go, or yellow or red. The entire “preflight” walk tbrough is on a single screen. This makes you wonder why you dont have it on your own boat. It’s truly amazing. Sounds neat, especially as the Flemings have such a great reputation for well thought out, reliable systems (and — at least to my eye — may be the best-looking motor yachts around). I adore Flemings and I’ve spent quite a bit of time on them. If money were no object I’d park a shiny new 58 in the front yard (or maybe in a slip). Part of what makes Flemings so spectacular is they aren’t value engineered in the same way most boats are and hence they’re able to select truly the best systems with less priority placed on price. The Boening system is very impressive but having seen how much effort goes into the commissioning and delivery of a Fleming I have concerns about its suitability for high volume applications. It’s also worth considering on the ID systems that the displays are separate from the integration hub (or black box in current parlance.). This means the integration hub could potentially be upgraded or swapped out without changing the custom cut glass dash. This would likely only work with Navico product since I’m assuming the connection between display and hub is proprietary. But, I do think overall we’re heading down a road similar to automotive dashes where, as the DIN and double-DIN car stereos were abandoned it became much harder to potentially impossible to just swap a head-unit. I think this would be a great model. I would find it unlikely that vendors would adopt open standards like HDMI, etc. as they would cannibalize their own upgrade opportunities, just like in the automotive market where proprietary head units and connections to displays still exist. Of course you’re still stuck with one vendor, but that is not the end of the world. The trend clearly appears to be that all vendors understand that using a pre-built, already tested operating system (mostly Android) is a better way to spend their time than developing their own, and that accessing other devices can be done through semi-modern methods such as HTML5 and remote web servers. Both of these fundamental changes in how marine vendors are approaching these problems free up immense amounts of time. Instead of them having to develop everything from the ground up, it is more of an interface set of work, which should be far less effort. The analogy between cars and boats is an interesting one, but one significant thing should be remembered; the vast majority of cars on average have a lifespan that is 10-15 years. A typical boat will likely be around for a far, far longer time. Boats are seldom ‘total lossed’, and who’s ever heard of someone scrapping a boat as long as it still floats, even the most run-down boat is on-sold to the next sucker! The electronics will have failed a long time before the boat is even considered ‘over the hill’. With everything integrated, the inevitable replacement through the need to restore functionality, or simply to modernize, becomes a pretty intimidating prospect. So potentially great tech for the new boat buyer, troublesome for the used boat market. Side comment (or is that – “snide”) . . . either way . . . my current truck had, as a package which I couldn’t pick the items, GPS included on the display/software. After a few years, the dealership sent me notices that it was time to update (and upgrade, I imagine) the data and maybe the operating system on my unit for a one time cost of . . .$$$ . . . really!!?? No way! I could’ve gone out and purchased a brand new (with life-time updates) GPS with better functions (since technology advances sooo fast . . maybe a Garmin?) for much less. Is this the way that we’re going now? First, I totally agree that comparing vehicles and boats is a little silly but not all that much. Some of these systems are definitely “DUO-able” but to what extent will these updates/upgrades cost the owner? I can see some real abusive groundwork possibilities . . . and what will the new owner think when he finds out that; “oh yeah, that’s the boat of his dreams but it will require and additional $$$$ to update the electronics because the previous owner didn’t want to spend the money since he was thinking of selling . . . . ” . . . hmm, a very real possibility . . . of course, that happens so some degree now but they are more easily replaceable than the glass bridge concept (as much as I love it).